I feel like up until this year I have been so bad at eyeliner, and then I really made the effort, invested in a good eyeliner and really practised, and while I am not the best, I have definitely seen a drastic improvement in my skills and abilities. 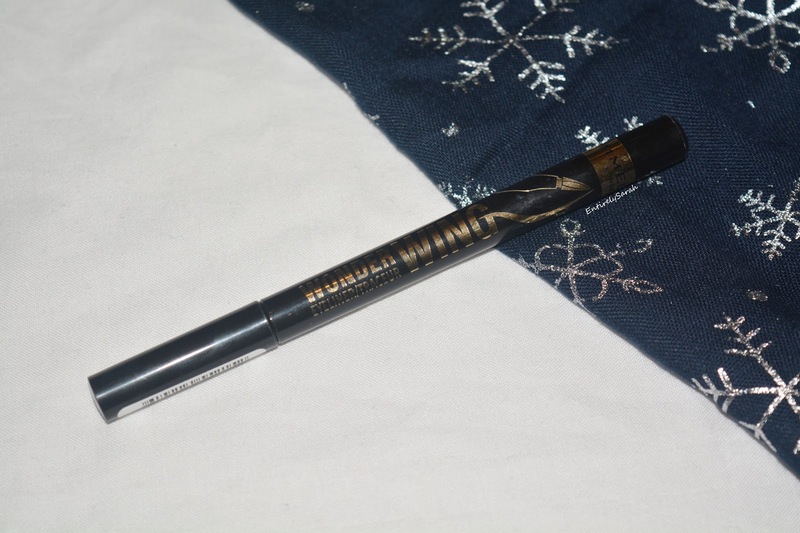 When I saw the Rimmel wonder wing eyeliner had launched and was shaped to imprint the wing liner with minimum effort, I really wanted to give it a go and see if it was as easy as they said it would be. The Rimmel liner is a felt tip pen style packaged product which is really easy to use and hold when doing your liner. The pen is housed in black plastic with beautiful gold writing on the pen to give it distinct branding. I like the branding on the pen and think it gives it a simple but effective look with minimal information, but enough to cover the basics. The cap is really secure and easy to put onto the pen as I know in the past I have used pens that feel like the cap is clicked on and it isn't fully on and it leads to the product drying out before it is fully used up. In terms of the applicator this is shaped like the wing you would make with the eyeliner. The triangular point gives it a distinct shape, while it is rounded around three quarters of the way around and then has a flat edge to help create the wing on the liner. I find you can place this down sideways to stamp the liner on and then touch up with the tip of the liner. The tip is thin enough to create a precise thin line, while also being able to easily create a thicker line on the lash line if you prefer something slightly thicker. 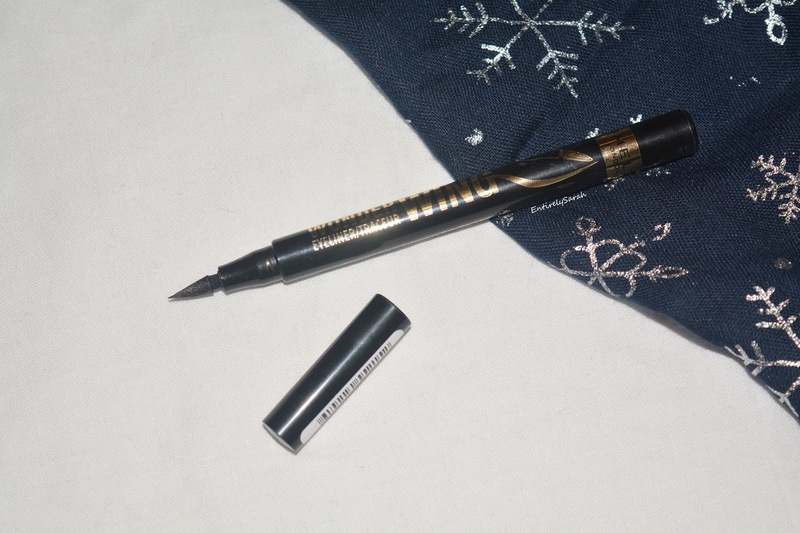 The eyeliner itself is a really rich black shade and is very pigmented when applied to the lash line. I really like that this is so pigmented as I don't like having to go over my eyeliner and I think especially with the stamp it would be messy and hard to work with if it needed going over several times. When I first tried this eyeliner, my first impression is in a video here, I wasn't sure how I felt about it, it wasn't as easy to use on a first go as I expected it to be and so I persevered before reviewing it in depth and I can say after a few uses it is way easier. I use this all the time now to lazily apply my liner when I don't want all the effort of drawing it free hand. Above is a swatch section of the liner on my hand showing the thin lines you can create as well as some stamps of the wing to show how they can look when you stamp it on. When applied the eyeliner wore really well, it dried quickly and didn't smudge on my eyes meaning it was easy to put on and you don't have to wait in case of smudging. I found this was long lasting, it didn't flake or smudge on the eye and I could wear it all day without seeing any fading or wear when I came to take it off in the evening. This was also easy to remove with my oil cleanser of choice, as well as being able to remove the swatches with micellar water between swatch photos, so I know you wont need any extra effort getting this off you eyes. Overall I really like this eyeliner, I think it is such a nice concept and one I definitely think will help people create a nice wing liner simply and quickly while helping them to learn some of the skills and build up their abilities. I find the tip is really easy to use on my lash line and I find myself always reaching for this one for the ease of the wing, maybe out of laziness, but just because it is so lovely and works so well all round! At just £5.99 and often on some sort of promotional offer, such as 3 for 2, it is a nice price to pay for a high street eyeliner that is pigmented and gives the aid of the shaped nib. I definitely think this will be a game changer for people struggling to create a wing and I know it is one I have really been loving using. If this sounds like something you would love to try you can shop it on Boots here. I would love to know your go to eyeliner, so do let me know in the comments as I love testing out liquid liners to see which I love and which ones are hidden gems, and I would love to know if you have tried this and what you think to it!